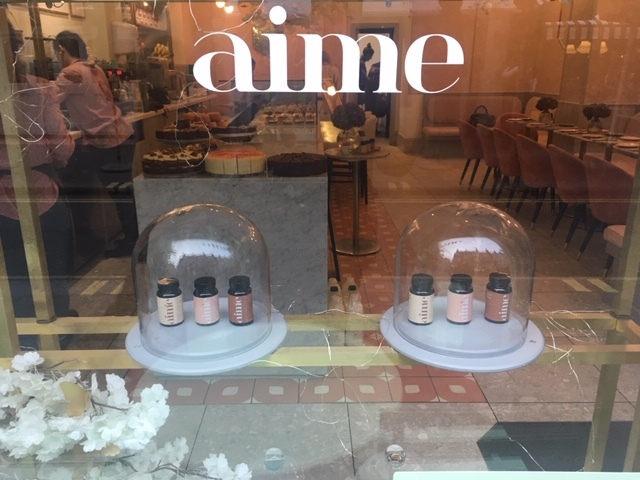 In addition to eye-catching branding, Aime is results driven, contains good quality ingredients & is affordable, at £30 for a monthly pack (you take two capsules a day, first thing in the morning, accompanied by a glass of water). 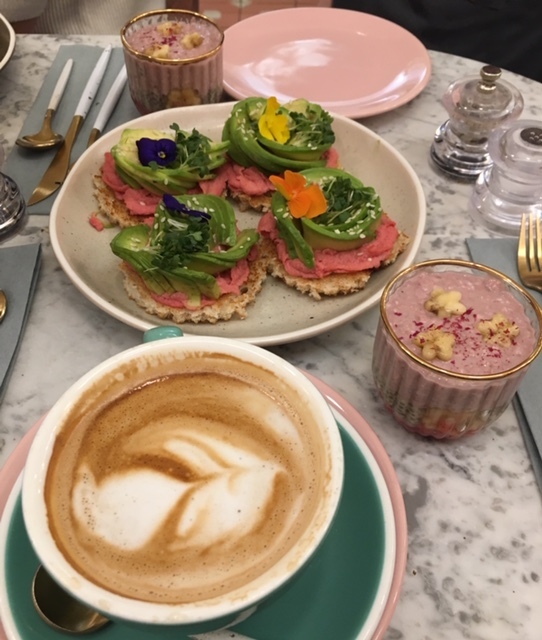 There are more and more supplements being launched all the time, with retailers like Net-A-Porter reporting double digit increase in demand & orders, but more & more of them make dubious claims and cost a small fortune. 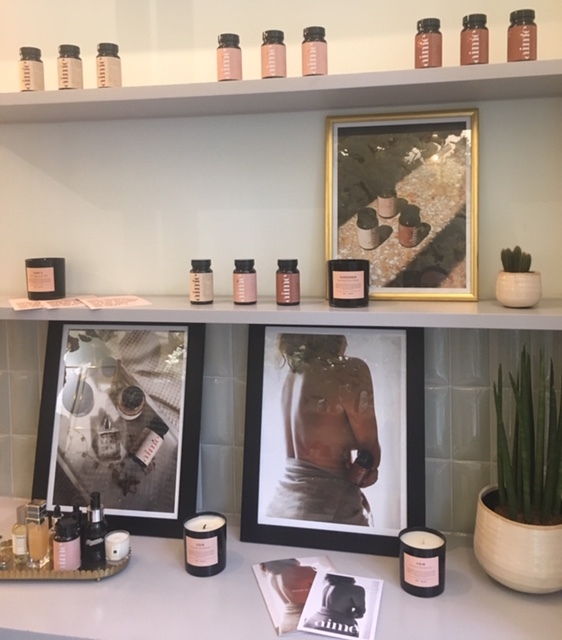 Well, not so in this case, something that I attribute to Mathilde’s pragmatism, based on the simple fact that women often tend to be either scared of taking supplements or overwhelmed by the choices and she wants to offer simple, yet sophisticated products adapted to female skin needs. PURE GLOW, 60 capsules, 1 month supply, £30: contains Magnesium, Turmeric, Spirulina, Zinc & Probiotics. This supplement promotes better digestion & calms inflammatory processes within the body. It is ideal for problematic skin, including skin prone to acne, during your period and for skin in need of a re-set. Teens can take it from 12-13 years of age. FRENCH GLOW, 60 capsules, 1 month supply, £30: contains Borage, Hyaluronic & Alpha Lipoid Acids, Probiotics, Eschscholzia Californica. Created for the skin that doesn’t need make-up to make it look good. Works for all women, irrespective of age. 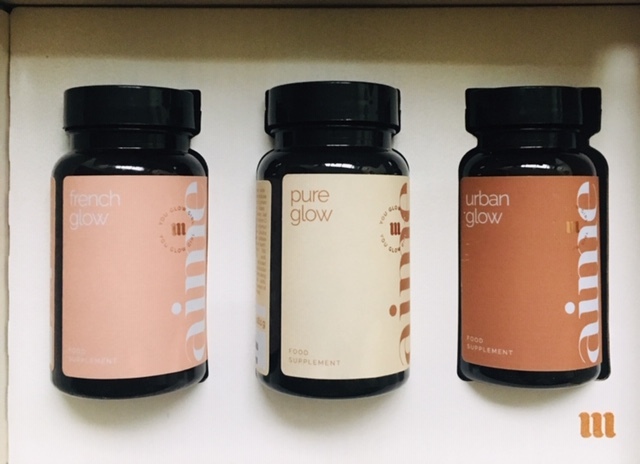 URBAN Glow, 60 capsules, 1 month supply, £30: contains Evening Primrose, Lady’s Mantle, Spirulina, Lycopene, Vitamin C, Saffron & Probiotics. This antioxidant-rich formula was developed to protect against daily environmental aggressors, like pollution, as well as stress. It is ideally suited to all women, but particularly to those living in big cities & post-menopause. All three types of Aime beauty supplements can be taken individually or in conjunction with each other, with no risk of overdose. 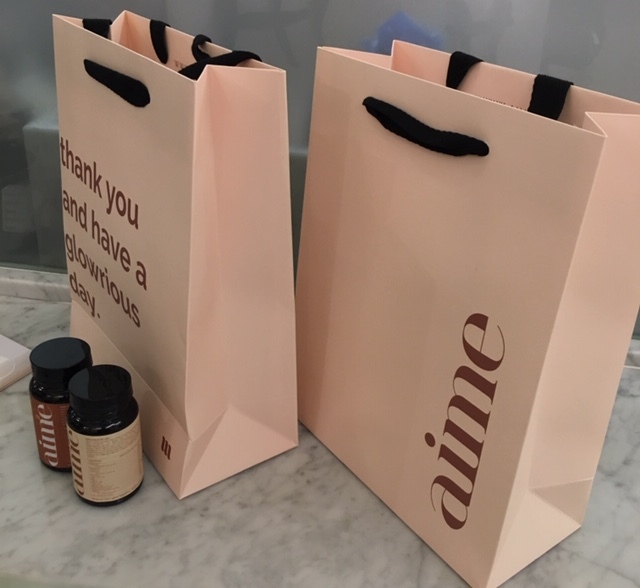 In order to find the best suitable to you & your skin needs, you can take a short questionnaire on www.aime.co which will guide you towards the most appropriate Aime supplement for you. 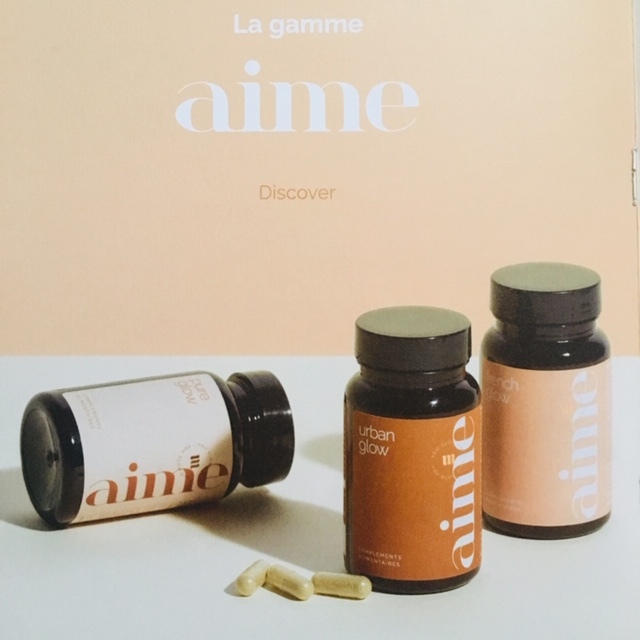 Each of Aime supplements was created and exclusively developed by Mathilde’s naturopathic doctor Valerie Espinasse & the R & D team of Aime in response to the needs and desires of modern women of all ages. 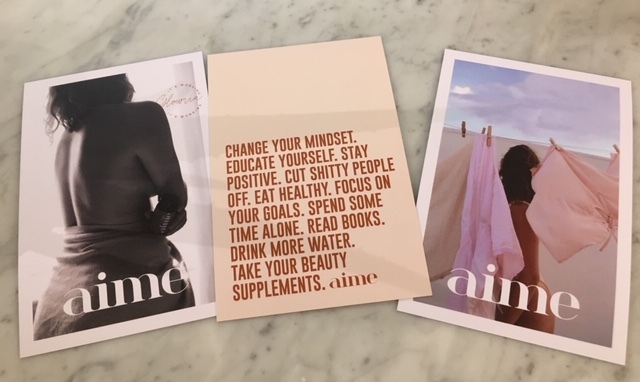 In each of the Aime supplements you will find a balanced blend of plants, vitamins & probiotics that were researched, combined and created for women of today, no matter age, skin type or colour, something that the beauty industry is only starting to fully address, pushed by the likes of Rhianna & Iman. Each capsule was ‘engineered’ in a way that conserves the quality of each ingredient before they are taken and each supplement is suitable even for the sensitive stomachs, so most women will have no problem taking it first thing in the morning, on an empty stomach, without feeling sick or queazy, as is the case with some supplements (there are also some ingredients or supplements that simply shouldn’t be taken on an empty stomach, so always best to check with your doctor, in case you suffer from digestive or stomach conditions for which you are treated). What is particularly appealing is that Mathilde doesn’t promise you miracles in a pill form. What she does say is that you can expect to see a difference in your skin after two to three months of regular use. She also reinforces the fact that a healthy micro biome is essential for our skin and when it is out of balance, it can be responsible for many skin problems that we encounter, so its only natural that each of Aime supplements contains probiotics, which are ‘shelf-stable’. What it means is that the probiotics have undergone heat treatment to ‘deactivate’ the bacteria without killing it. This process halts fermentation, whilst maintaining the protein structure, biological properties and immunomodulation, so once you open any of the Aime supplements, you don’t need to keep them in the fridge. After talking to both Mathilde and Francois I was intrigued to put the supplements to the test, particularly as the other women at the presentation were much younger. While one of the influencers lamented the fact that she generally forgets to take supplements, unless they stand next to her cat’s food, my own focus has always been on nurturing my body and my skin with discipline and consistency, as you can’t expect results from doing something sporadically. Even though Mathilde is younger then I am, we both went through pregnancy and childbirth multiple times and know exactly what it does to one’s skin, particularly with lifestyle changes and lack of sleep. I started taking FRENCH GLOW in December, a week or so after the presentation and within a couple of weeks noticed an interesting thing, but it wasn’t exactly positive. Constipation – something that I have never suffered from! I haven’t changed my lifestyle or diet, so could only attribute it to taking the supplement, so I contacted Mathilde via her lovely PR. The reply arrived swiftly and helpfully: ‘It may be the probiotics, you know they help with the digestion and bloating. Our micro- nutritionist Valerie Epinasse and I would suggest either you try to continue up to one month on the course at least to see if it lasts (because 15 days is too short, it may just be the body adapting to a new routine.) Alternatively, you may wish to cease taking FRENCH GLOW & move over to try either URBAN GLOW or PURE GLOW. Do let us know if you have any side effects with those and we very much hope you will experience the positive results.’ While this advice was insightful, I was a little baffled to hear that I was the first customer to mention this side-effect. Surely I can’t be such a big anomaly, considering the gaining popularity of this supplement range, which seemed to be temporarily ‘sold out’ in the run up to Christmas? Determined, I did stick to taking FRENCH GLOW, but instead of drinking a small glass of water, I made sure I drank a bigger won alongside two recomended capsules. Within days, I was back to my usual self in terms of elimination process and after completing the first month, I have now moved to URBAN GLOW. I am sure you want to hear the answer to the question of whether my skin looks any different since I started taking Aime? Well, I generally have good skin irrespective of whether I take supplements or not, but I have noticed that my skin looked plumper. Interestingly enough, it didn’t get any drier after a week-long trip to sub zero Finland. It feels soft to the touch and on a few occasions I have been known to do a school run with only under-eye concealer on top of my serum and moisturiser – whether I had French skin glow is not for me to judge .) I certainly look forward to seeing what happens when I have completed taking Aime trio, before spring arrives on the doorstep & am impressed with the professionalism & engagement of Aime team. Aime supplements are non GMO, vegan, cruelty-free, gluten free. Made in France. 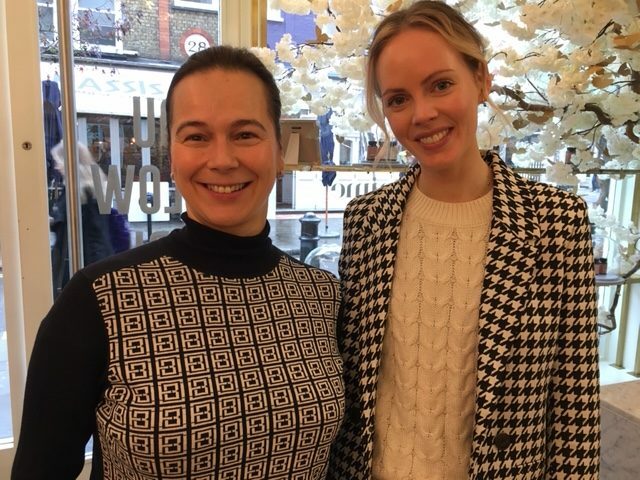 For the time being Aime have chosen primarily to sell the products via its own website, in order to provide the customer with the best price & level of service, but it did recently launch exclusively in Liberty London. In Paris they have been hosting successful pop-ups, the second one will take place during Paris Fashion Week at The Hoxton Hotel, January 20-27. For more information about Aime, please click here (NOTE: this in NOT an affiliated link & I don’t earn any commission from Aime).